How Many Peters were there? Are Peter Hazelbaker of Virginia and Pennsylvania, Peter Hasselbacher the German/British Revolutionary War soldier, and Peter Hasselbacher born in Münchsteinach, Ansbach-Bayreuth in 1759 all one and the same person? If you have always thought the answer was yes, you were almost certainly correct but until very recently the evidence was largely circumstantial, sometimes ambiguous, and in a few instances incorrect. It has only been in the last two years that primary historical documents confirming the connections have become available to us in America. Let me take this opportunity to summarize again what we know, how we came to know it, and how good the evidence has been. I will also present a new piece of primary evidence that the Peter Hasselbacher born in Münchsteinach is the same person who died around 1800 in rural western Pennsylvania. Family lore and written family history from the late 1800s tell the now famous story of Peter the soldier, conscripted in Germany to fight for the British in the American Revolutionary war, captured in Yorktown, detained in Virginia, and like so many of his fellow soldiers, remained in America to start a new life. Hazelbaker descendants Jill Foley and Greg Humphrey summarize these old stories for us elsewhere in these pages. To my knowledge, there are no primary official documents in America containing the name Peter Hazelbaker. I do not know who in America first discovered that there was a soldier named Peter Hasselbacher in the Ansbach-Bayreuth Regiment. The name Peter Hasselbacher, but not the birthplace, appears in scholarly lists of soldiers who remained behind, as for example, the 1955 German thesis of Dr. Erhard Städtler. It is not a great leap of faith to assume that the name Hasselbacher became Americanized to Hazelbaker. (Hazelbaker is not a German name. There are none in Germany today.) Last year, Craig Hazelbaker and his colleagues unearthed a document in the British archives confirming and dating the voyage of Peter Hasselbacher to America in 1777 along with the main body of the troops. Despite the paucity of documents, I don't think anyone doubts that Peter Hasselbacher and Peter Hazelbaker are the same person! Somewhere along the line in the past 20 years or so, some Hazelbaker historian learned that a boy named Peter Hasselbacher was born in Münchsteinach, Ansbach-Bayreuth in 1759. (Because the method and fruit of this search was never published, I cannot give proper attribution.) An assumption was made that this was the Peter who came to America. 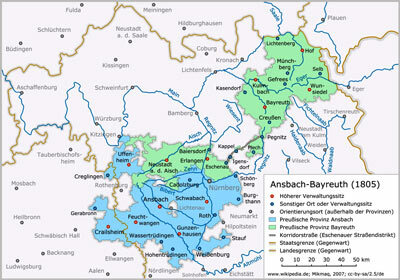 The Hasselbacher family living in the valley of the River Aisch near Neustadt, Germany has been well known to German genealogists. Our family was one of the Exulanten, religious refugees from Austria in the mid-1600s. The family tree of the Hasselbachers, including those from Münchsteinach, had been in large measure compiled through systematic transcription of area church books, a fact that is in abundant evidence in the pages of this website. I have personally corresponded with two descendant family lines stemming from Balthasar Hasselbacher, Peter Hasselbacher’s oldest brother, and there should be other distant relatives of the Hazelbakers out there. It was certainly not unreasonable to hypothesize that Peter Hasselbacher of Münchsteinach became Peter Hazelbaker of America. Born in 1759, Peter would have been 18 years old when he was conscripted. Aside from his birth record, his name does not appear elsewhere in the church records of Münchsteinach, compatible with his having left the village for good. In one of the typed transcriptions of the church books, it is penciled in that he went to America, but this was obviously added later. In a list of soldiers who remained in America prepared by Jochen Seidel around 2002, the soldier Peter Hasselbacher is said to have been born in Münchsteinach. On the face of it, this might seem to provide conclusive evidence that the two Peters are the same Peter. It should also be kept in mind that Peter was not a traditional given name for the Hasselbachers of Franconia. Peter of Münchsteinach was to my knowledge the first. He was named after his godfather, Peter Wendler, a farmer who lived in the small adjacent village of Kleinsteinach. Peter’s brother Balthasar subsequently had a son named Peter, and Peter Hazelbaker named his second son Peter in America, but otherwise there are very few of us– and none other in the Hasselbacher family line of that time. Did Peter live in Münchsteinach or Ansbach in 1777? I have no primary records at this time to know for sure. It remains (very) remotely possible that there was a second Peter Hasselbacher living in the town of Ansbach. However, because he was not the oldest son, Peter of Münchsteinach might well have had to travel elsewhere to learn a trade, or travel as a journeyman following an apprenticeship in Münchsteinach. His other brothers appear to have ultimately remained in Münchsteinach. I was stimulated to write this update when I stumbled upon a contemporary primary source that makes it absolutely clear that the soldier Peter Hasselbacher who did not return from America was indeed from Münchsteinach. How I was led to this document makes the point again how important it is for us all to share and publish what we know. The smallest of clues from unexpected places will open doors that one never knew even existed. So it turned out to be for this story. A few months ago, Greg Humphrey, a Hazelbaker descendant who has contributed much to this website, sent me a paper about the history of the Ansbach–Bayreuth Regiment following its capture at the Battle of Yorktown– the turning point of the Revolutionary War. 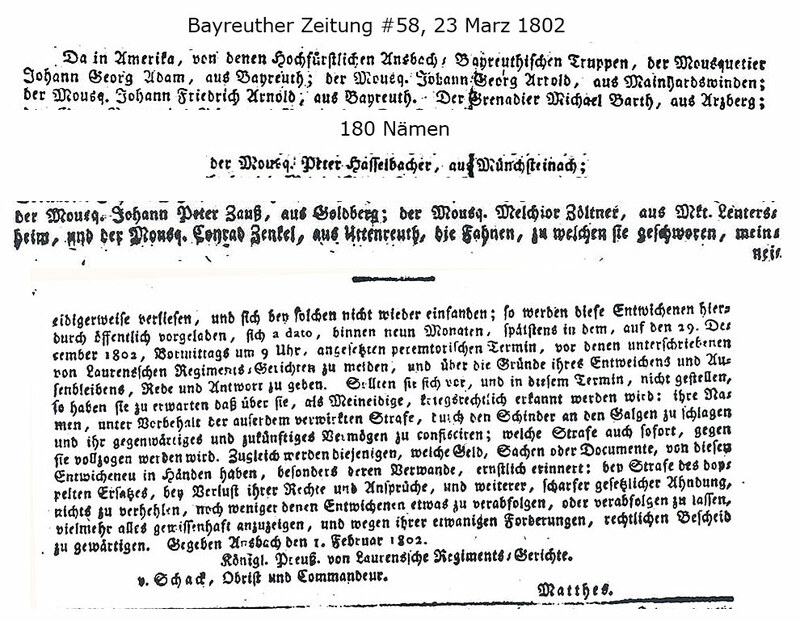 The paper itself was fantastic, but when I went to the website on which it was presented, I discovered a family much like our own: originally from Austria, part of the Protestant Exulantin who emigrated to Germany, and which sent one of their sons to America to fight for the British and who stayed! 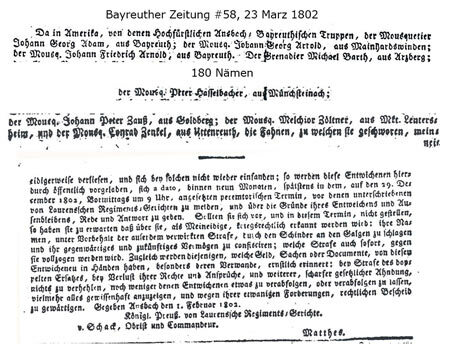 One of the pieces of information displayed on that extensively documented website was a brief excerpt from a list of presumed deserters from the Ansbach-Bayreuth Regiment that had been published in a German newspaper as a legal notice in 1802 . I wondered if our guy might have appeared on the same list. Through the miracle of the Internet, I was able to find a copy of the complete article and in it is the name of a Peter Hasselbacher from Münchsteinach. The loop has now been closed! Of course this does not rule out the possibility that at the time of his conscription Peter was present in the town of Ansbach, but this may be the best evidence we will ever have that Peter Hazelbaker of America was born Peter Hasselbacher of Münchsteinach. I present the document with my translation and interpretation on a companion page to this one.